The brief called for a complete modernisation of a two-bedroom 1980s basement apartment in Chelsea. With both light and space in short supply, the client asked for a piece of architecture that possessed the spirit and sophistication of traditional and contemporary J apanese architecture without reverting to pastiche. As the building is located at the lowest level of a 6 story Victorian terrace. The decision was made to strip the apartment back to the structural frame in order to optimise the design in terms of ceiling heights and construction tolerances, which also included removal of the existing screed. To make the most of the south-facing courtyard garden, the windows were made full height and the rear French doors enlarged to bring the outdoor spaces into the flat. To further emphasise the fluidity of space between inside and out, the kitchen run continues into the garden. The courtyard itself has been conceived as a series of rooms suitable for entertaining. For example, the lounge area features an external kitchen complete with a barbecue and up lit bamboo planter in lieu of a hearth. The outdoor dining area has recessed lighting, the outdoor bathing area is equipped with a timber-faced hot tub, and a contemplation space is anchored by an Acer. A poured resin floor unifies the entire apartment with a seamless finish between the rooms, and combined with ultra-slim acoustic linings in the ceiling, maximises the ceiling height. In addition, doors are full height so that ceilings are continuous between the rooms. 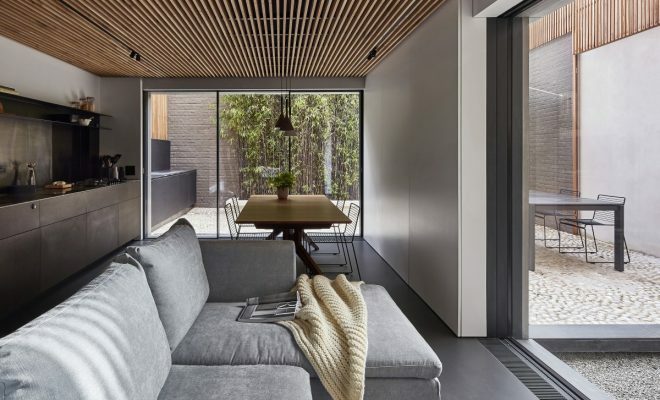 The oak slatted ceiling that spans the open-plan kitchen, living and dining space allows for lighting to be easily reconfigured to suit different layouts. In a small apartment such as this, it was vital to make use of all available nooks and crannies in order to maximise on room sizes and reduce visual clutter. In the heart of the plan, the utility cupboard, media centre and walk-in master wardrobe are grouped together, to avoid dead corners that waste precious storage space. Both the utility cupboard and walk-in wardrobe are concealed behind frameless doors. The media centre and the client’s record collection are housed in a recess in the living room wall that can be hidden away by sliding/ folding doors that align flush with the wood panelling and door from the hallway when closed. There is also a full height storage wall which is concealed behind the oak panelled bedhead in the master bedroom. All of the services are hidden in areas where storage was not possible. The flue and ventilation extracts to outside are located above the external stainless steel shelf detail a the head of the rendered walls so that it is discrete as possible. The kitchen extract is hidden behind the splashback of the external kitchen. All of the materials we chose form a palette of muted, natural colours that reference the J apanese aesthetic of Zen palaces. The materials are colour true with a matte or satin brushed finish, so that as the apartment ages the finishes will develop a patina from use, ageing gracefully over time. We have installed the latest home technology within the apartment but have taken care to hide it away as much as possible. As new kit becomes available, the flat has been designed so that it can be completely rewired without damaging the internal finishes. 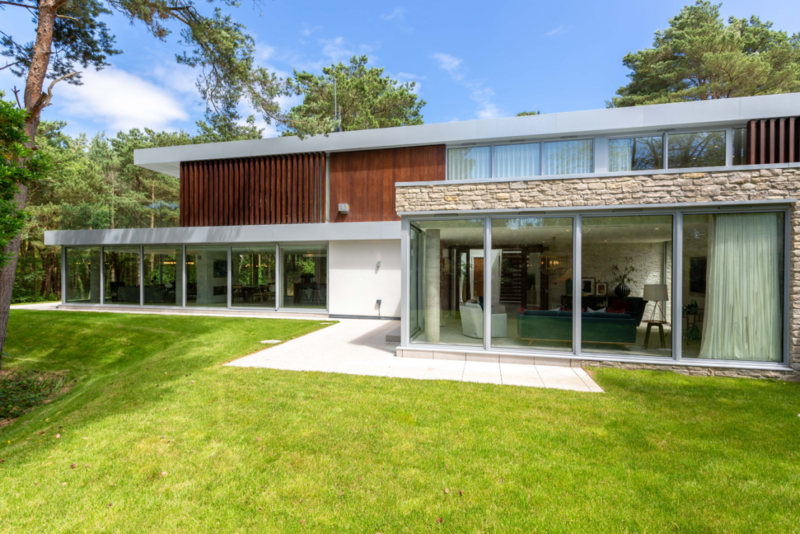 All of the existing fabric has been dramatically upgraded in terms of thermal performance, including the installation of a new energy-efficient boiler, whole house ventilation with heat recovery and below ground rainwater harvesting. It is our hope that by rethinking the flat in this way, it will ensure that it’s lifespan will be extended for at least another 100 years.